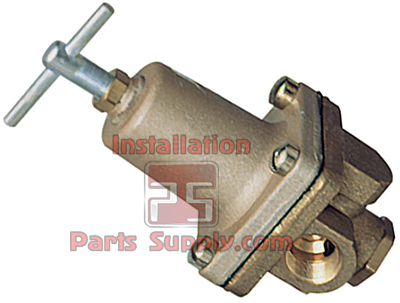 Small Pressure Regulators are used in small, general purpose applications to regulate pressure in Hydraulic / pneumatic systemsusing water and No. 2 fuel oil. 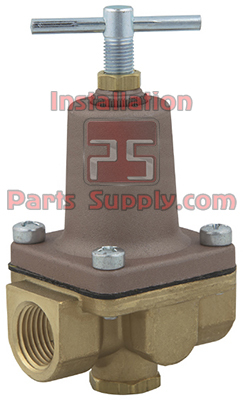 Watts 26A Series Pressure Regulators constructed with a brass body with Female NPT threads inlet and outlet connections, 1/4 in. 2-way low-pressure gauge port,aluminum spring cage, Buna-N stainless steel disc, reinforced Buna-N diaphragm, and tee handle adjustment. Options include Viton trim and slottedadjusting screw. Strainers are recommended. 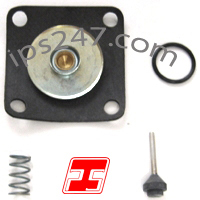 Watts 26A Series has an over sized orifice and is ideal for use on beverage dispensing and paint spraying equipment, ice machines, humidifiers, drinking fountains,and many other applications. The Female NPT body is ideal for any and all applications as they are easily adapted to any style Fittings to fit your application; Brass Fittings, Brass Pipe Thread Fittings, Brass Compression Fittings, Brass Garden Hose Fittings, Brass Hose Barb Fittings, or Stainless Steel Fittings, Stainless Steel Pipe Fittings, Stainless Steel Barb x MPT, Stainless Steel Fittings Kit.InstallationPartsSupply.com has the Fittings and Watts Regulators you need.